CCMI’s Education team is pleased to offer the following resources to educators to use in the classroom. Please contact our team education@reefresearch.org if you would like more information about the educational opportunities available at CCMI for you and your students. These lesson plans complement CCMI’s Reefs Go Live programme, which are aligned with the Science National Curriculum objective for Years 5-6 in the Cayman Islands government schools. 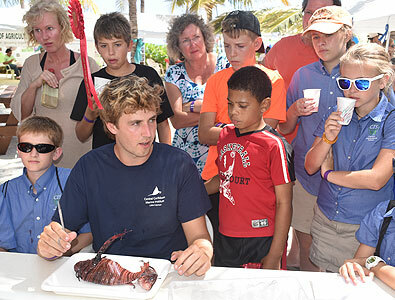 Participation in the live dive broadcasts and use of these lessons is open to all teachers in Cayman, regardless of age and subject matter taught. In fact, Reefs Go Live offers great cross-curricular opportunities to engage students in coral reefs as a real-life platform for teaching in other subject areas such as math and writing. These activity sheets are designed to enhance the Reefs Go Live broadcasts and engage students in active observation and understanding of the lessons presented by CCMI underwater educators and scientists. The fact sheets have been put together to provide additional information about topics discussed in the Reefs Go Live broadcasts.